With the NBA regular season winding down, the Golden State Warriors are 66-7 and need to go 7-2 over their final nine games to break the 1995-96 Chicago Bulls’ record for most wins in a season. We have a guess for how this will play out: Our CARM-Elo prediction system says Golden State has about a 66 percent chance of getting there. But we’d be lying if we didn’t say that handicapping the Warriors’ run to 73 is just as uncertain now as it was a few months ago. As the season winds down, those predictions become less abstract and might seem to take on more tangible meaning. It ought to be easier to predict a team going 7-2 than 25-5, right? But there’s a circular sort of logic to forecasting like this. On the one hand, when the finish line was further out, any effects of late-season lineup-fiddling from the Warriors or their opponents were aggregated over many games. The system doesn’t know that Stephen Curry may sit down in the final week of the regular season because the Warriors secured a 1-seed, or because of a sore hamstring, or because of a bad run-in with room service sushi. But the estimated effect of a game or two without the MVP is smaller in the context of a full season. This can make forecasts from months out feel more precise, less vulnerable to natural rhythms of the season. On the other hand, it takes a certain kind of willful omnipotent to guarantee that a team’s basic state — three healthy stars and the supporting constellations mostly intact — will remain unmolested by fate. The long-term outlook is always vulnerable to genuine surprise. As it stands, with nine games remaining, we know the state of the Warriors going into this stretch — a little banged up, but still plenty good. We can be relatively certain there aren’t any big surprises left in the season, just the series of little ones we always knew were coming: The tension between chasing the record and run-of-the-mill rest before the playoffs, plus some nagging injuries to rotation players and the need to bonk the rust off of a few guys coming back from longer-term absences. 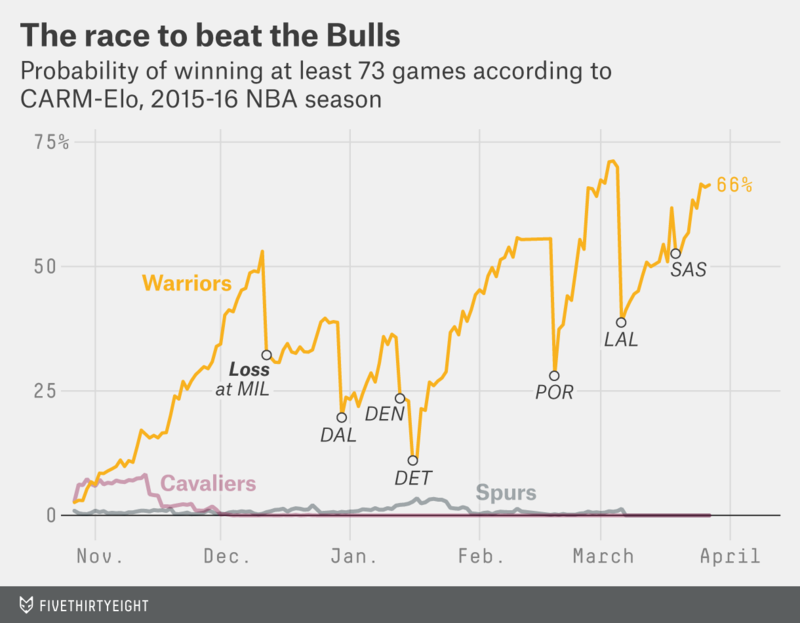 Now that we’ve arrived at the precipice, though, the step from 72 to 73 wins seems as large as ever. Our model thinks the Warriors have an 89 percent chance to at least tie the Bulls’ record at 72 wins, but those odds fall 23 percentage points, to 66 percent, for 73 or more wins; 74 or more wins is a 33 percent proposition, but let’s not go getting greedy now. These projections also assume teams will play to win, which is uncertain for the Warriors, who can probably coast to a 1-seed, as well as their opponents, who will deal with all the typical late-season machinations for playoff seeding or draft position. By all appearances, however, Golden State is fixing to up and do this thing. Sunday night, the Warriors made good on the bluster when they took a full clip into a home game against the now 9-65 Philadelphia 76ers on a night a starter or four could have taken some rest. It’s a good bet, then, that unless something puts a scare to them, the Warriors will be the Warriors. What their opposition will do is less certain. Six of Golden State’s remaining nine games are at home, where the Warriors are 35-0 for the season. Two of those home games are speed bumps against the no-account Wizards and the incompetent Timberwolves. Those are the gimmes. Another two are a home-and-home against the Spurs. Those very well could be thrilling late-season playoff previews … or, more likely, 96 minutes of the Warriors’ regular rotation being trolled by one of Gregg Popovich’s “DNP-Old” lineups: 30 minutes of Boban Marjanovic, perhaps, or a team trainer wheeling Andre Miller’s sarcophagus around the court. Our NBA game predictions for these remaining games — upon which our broader forecast of the Warriors reaching 73 wins is based — pass the late-season sanity check, more or less. Your guess is as good as mine for those Spurs games, and the probabilities for the Grizzlies games are slightly janky because, honestly, the Grizzlies are pretty janky themselves. (Memphis tends to win games close or get absolutely annihilated, which kills its point differential and Elo rating, but the team has done this consistently enough that it’s essentially a bug turned feature.) Any discrepancies seem to come closer to canceling each other out than thumbing the scale, and it sums up as a tough but not impossible schedule for the Warriors to take at a 7-2 pace. That could be made easier if the Golden State roster gets healthy in the home stretch. According to Nathan Currier at Man-Games Lost, a website that tracks player injuries, Warriors players missed a combined 164 games through 72 games played (Sunday’s game against Philadelphia was the team’s 73rd), in the top 10 in the league in both total games lost and lost Value Over Replacement Player. Sixth man Andre Iguodala has missed the last few weeks with a sprained ankle; Festus Ezeli has missed 33 games; Harrison Barnes missed 16 straight games earlier in the season; Andrew Bogut hasn’t missed much time, but he plays just 20 minutes per game. The roster has seen enough tumult that Brandon Rush — a live body and a fan favorite who is nevertheless not, you know, good — has seen 25 starts. There’s a whole spool of loose threads waiting to be tied off in the Warriors’ season. Curry has 350 3-pointers, already 64 more than his standing record, and on its way to something truly absurd. Meanwhile, Thompson is sitting on 253 threes of his own and needs another 17 to move into fourth place on the single-season list, which just happens to be the highest spot on the list that doesn’t belong to Curry. The list of records that are certain to fall once this season is over is long and rich and telling. But holding the record for home wins in a regular season or team threes per game doesn’t have quite the same ring as 73 wins. As for that, it’s still a two-in-three chance, give or take. CARM-Elo adjusts itself to very good (or very bad) teams in the middle of its simulations a little better than similar systems. The other 27 teams aren’t included because they are for the most part a big, thick line at 0 percent.